The West Michigan city's food scene is heating up, with local chefs and brewmasters capitalizing on the region's agricultural bounty. Keep it green at downtown’s CityFlats, a smart 28-room, LEED-certified boutique hotel within a 19th-century brick building that used to be a jewelry store (from $159). Sleep on super-soft, eco-friendly bamboo sheets and a fluffy, locally made bamboo-blend mattress, then wake up with a Mary the Contrary, a Bloody Mary with a habanero-cheddar twist ($7), served during weekend breakfasts at the street-level CitySēn Lounge. Ask about the hotel’s beer package, which includes a howler, two pint glasses, tasting vouchers and a brewery map (from $229). Sleep in eco-friendly bliss at CityFlats. Pick between two different atmospheres at the Amway Grand Plaza: the modern glass Tower, with sleek furnishings and views of the river and rapids, or the historic Pantlind wing, where 13,000-pound crystal chandeliers hang over the late-19th-century lobby (from $189). Get some laps in at the indoor pool or take up a match at the fourth floor racquetball courts; then dip down to the lobby for dinner at the brand-new Kitchen Counter by Wolfgang Puck, slated to open this fall. Live like a local by booking an Airbnb, which was recently made legal in Grand Rapids after a protracted, highly publicized battle with city government. Choose from among about 100 listings, from this mod-styled Dutch colonial home in hipstery Eastown to this exposed-brick downtown condo in a former school building (both around $100/night), or this cottage with clawfoot tub near the Fulton St. Farmer’s Market ($149/night). The vibe is convivial and the menu uber-eclectic at The Old Goat. Sample ultra-local flavors at Grove, an “earth-to-table” spot that’s recently become a local hit. The menu changes daily, and a la carte is an option, but go for the three-course tasting menu (a deal at $39) that spotlights what’s in season locally, be it rye cavatelli pasta with beef tongue, buttermilk curds and whey ($12) or Great Lakes walleye with farro tabbouleh and charred fava bean purée ($32). Trip out your taste buds at the Old Goat, just-opened but already beloved for its bizarre Cajun-meets-Eastern-European (-meets-Moroccan-meets-Cuban-meets-barbecue) menu. Grab a seat on the outdoor patio or dine under pendant lamps made from oil barrels in the dining room as you dig into dishes like boiled peanut and black-eyed pea salad ($9) and something called Sauerbratenpotenyocken ($17), smoked short ribs served with spaetzle and braised red cabbage. Coming soon: house beers and gourmet sodas produced on-site in the basement brewery. Bring an appetite and a sock full of quarters to Stella's, a divey arcade bar that also happens to serve the best burger in town. Pull up a barstool between the vintage Ms. Pac-Man and Galaga consoles and grab a fistful of napkins, because these meaty beasts come stuffed with cheese and dripping with an assortment of toppings, from green olives and dirty-martini mayo to jalapeño poppers and bacon (from $10.50). Take advantage of the 250-label whiskey library and order a flight of Michigan-made whiskeys ($12) or an IPA from Bell’s Brewery ($5) to pair with your order of bacon-fat popcorn ($4.50). From yoga to make-your-own sauerkraut, there's plenty to do (and yes, great shopping) at the Grand Rapids Downtown Market. Find out why Grand Rapids calls itself Beer City, USA by taking yourself on a tour of the city’s top craft breweries. Start at Founders Brewing Co. with a thick, dark pint of the Breakfast Stout ($5.75), brewed with flaked oats, bitter chocolate and two kinds of coffee. Improve your palate at a Sensory Evaluation class, held at the brewery quarterly on the third Tuesday of the month ($40/person). Then head eastward to newcomer Elk Brewing for a snifter of Scotch ale ($5.50) before stopping for lunch at Brewery Vivant, housed inside a former funeral chapel (don’t miss their barrel-aged beers and the cask-conditioned “firkins”). 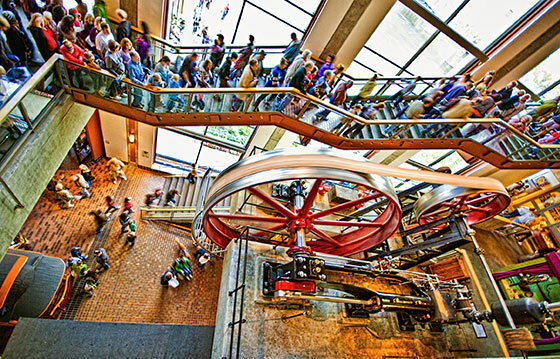 Hop on a behind-the-scenes tour, held Saturdays at 2 and 3:30 p.m. ($10). Next, sample winemaker Jason Lummen’s uncommonly nuanced ciders made from Michigan apples at teeny-tiny People’s Cider Co., tucked into a nondescript industrial complex on the east side. Finish the day back downtown at Hopcat, where you'll choose from about 150 IPAs, barleywines, porters, stouts, strong ales and other styles from Michigan and beyond. If planning a trek harshes your buzz, just outsource the planning and driving to Grand Rapids Beer Tours ($50). 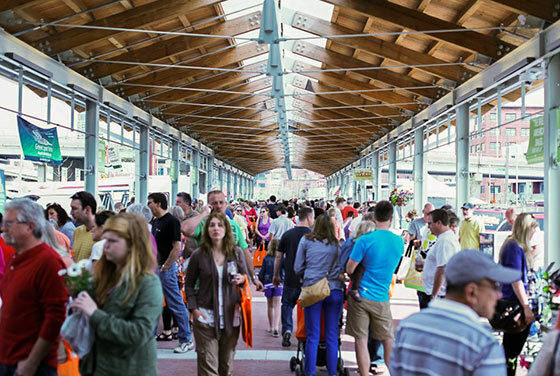 Discover the Eataly of West Michigan at the new Grand Rapids Downtown Market. Take a morning vinyasa yoga class in the upstairs greenhouse ($10), then head to the teaching kitchen, where you can learn to infuse your own bourbon, ferment your own sauerkraut, make boozy ice cream sundaes, and much more ($35-$55). On Saturdays during the summer, cruise around the alfresco farmer’s market in the parking lot, complete with food trucks, free educational events for kids and an outdoor bar for grownups. Before you go, be sure to fill a growler with cold brew or kombucha at Relish Green Grocer, sip Michigan-made vodka and rum at Grand Traverse Distillery, and sample the 50 different cold-pressed olive oils at Old World Olive Co.
Drive just a few minutes outside of town and find yourself on verdant country roads lined with small family farms and orchards, many of which are open to the public on weekends. Dine amid apple trees and weeping willows at Lubbers Farm , which hosts seasonal dinners with local chefs and also sells fresh bread, local honey and goat cheese from its farm stand. Gather eggs, milk cows, groom horses and dig into other hands-on farm stuff every Saturday at 11, when the Lubbers offer a free walking tour of the farm. Pick your own apples, peaches, plums and sweet cherries at the 108-year-old Moelker Orchards, a 75-acre fruit farm just down the road; stock up on fruit pies, donuts and home-made fudge at the adjacent Old Bell Bakery. Stroll through colorful installations galore during the fall ArtPrize festival. From Chris Perkey, chef/owner of Osteria Rossa. Cherry Street is a really lively, vibrant community; the younger kids all live over there. Richard App Gallery does the art in our restaurant, and the Wealthy Theatre nearby shows a lot of international and indie movies. Catch the sunset out at Holland Beach. All those lakeside towns like Holland and Muskegon have very unique lighthouses with a lot of history behind them. It’s insanity downtown during ArtPrize (Sept. 23-Oct. 11). There’s 200,000 people in town, art everywhere and food carts down by Rosa Parks Circle. I love that it makes Grand Rapids feel like a big city. Pick up On the Town and the West Michigan Revue for details on the weekly art and entertainment goings-on. Stay current on the local brewing news at the Beer City USA blog, with info on events like the annual Grand Rapids Beer Week (Feb. 21-27, 2016). Keep up to date on foodie happenings in Grand Rapids and its environs on local food blog Just a Grain of Salt.